In the tradition of the Truck Simulator, there is one that takes place only on the roads of the United Kingdom. This is UK Truck Simulator. Drive your truck across England, Scotland and Wales. The graphics are successful and above all different, between urban landscapes or more rural landscapes, there is something for everyone. The maps are large and allow you to see different environments. In terms of driving, the handling is still as pleasant as in the other opuses. You must always manage the delivery of goods from point A to point B. The more difficult missions bring in more money, of course, which will allow you to improve your truck or buy a new one. 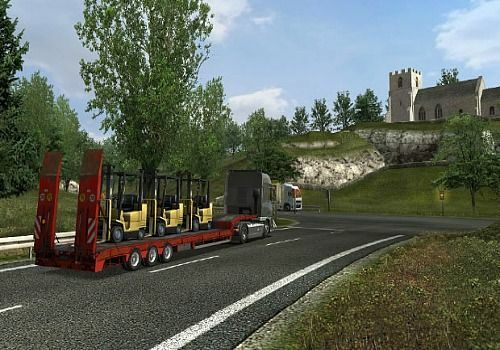 With UK Truck Simulator, you can enjoy a short trip without leaving your home. A must-have for simulation game lovers. Become the manager of a transport company and create your network to satisfy your users. Make strategic choices to optimize travel in your city.